Chewing my way down the river. If you needed to chew the air today, go outside. It's thick. The humidity. I ate it. I went outside, walked into the parking lot and I came back full. If there's anything in the world I hate more than having to drive 55 mph in a 55-mph-speed zone, it's humidity. My hair isn't meant for moisture. I sweat. I get uncomfortable. I can't sleep. I'm 100 percent miserable. Even better, I get to camp all weekend. Camp. In this heat. Sleep. In a tent. However, I can find some solace in the fact that I'll be spending the entirety of my day tomorrow in a river. A cold river, I hope. That's solace, right? 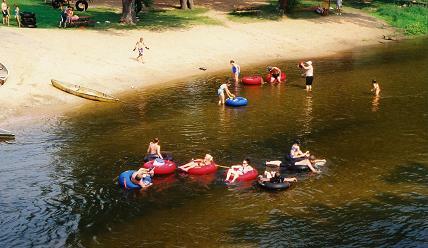 We're spending the day in tubes, floating down a river. I believe alcohol is involved. And sunburn. And sweating. And strangers. Of course, you know me and strangers. The whole combination sort of gives me an anxiety attack. OK, so scratch the solace idea. I do enjoy floating. And I do enjoy water. And I do enjoy camping and tents and weekend get-a-ways. So for the weekend, I'll just take a deeeeeep breath and pretend there's no sweating, humidity or strangers. The Fiance's got my back. That's right. (Still not used to the "F" word). But, uh, let's hope he brought a fan or something, too.